Since I posted this rather late yesterday, just a reminder. 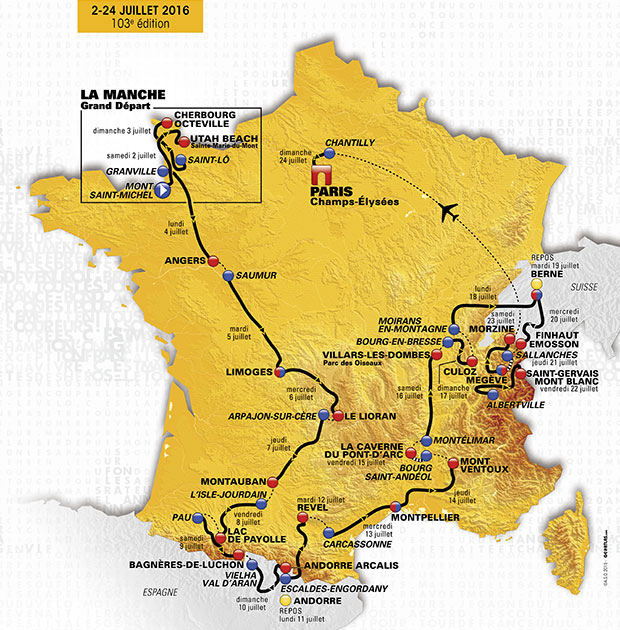 The 2016 Tour France route was presented Tuesday. We have all the dope. Stages, map, even some stage profiles. It's all right here. The full 2016 Tour de France parcours was unveiled at the official presentation in Paris on Tuesday and displays a Tour consisting of several new summit finishes making their first appearance, a tough revisit to the top of Mont Ventoux and two challenging individual time trials likely to be some of the turning points of the race. After analyzing the 21 stages of next year’s Tour de France, the main goal of his 2016 season, Alberto Contador asserts that the tough parcours will be one for the climbers. "Next year's parcours appears to be very difficult and one has to start in good form because the fifth stage already has a fairly demanding finish. The two time trials stand out and are probably the ones that make the difference from the 2015 parcours. Both time trials are tough, the first one not excessively long and a priori I like them both." "The mountain stages are evenly spread out from start to finish and you will have to manage your forces very well in order not to reach the final stages worn out. Is it a Tour for climbers? Yes, it is, although last year's Tour was even more since it didn't have so many time trials. It clearly is a course well suited to the profile of climbers." "Overall, it is a parcours that I like, but as it is well known with the Grand Tours, it can turn against you at any moment. Without any doubt, it can be a nice and attractive Tour and I will prepare for it one hundred percent”, adds Alberto Contador. The 103rd Tour de France travels counter-clockwise from its starting point at Mont Saint-Michel and takes on the Pyrenees head on already on the seventh stage. In total, nine mountain stages and two individual time trials, one of them being a mountain TT, await the riders. Nevertheless, the first, flatter stages in Normandy could equally play an important role, assesses Steven de Jongh, Tinkoff-Saxo Head Sports Director. “Stage 12 to Mont Ventoux will naturally provide a stunning backdrop to a very difficult stage, where the heat and wind can play a pivotal role. But what is also interesting is the 37km time trial the day after to the Gorges de l’Ardéche and the riders have to tackle it with Ventoux still fresh in the legs”. “The second individual time trial on stage 18 is shorter but it’s almost uphill the entire time and it’s followed by two hard mountain stages to conclude the general classification. The plan is naturally to go for the win with Alberto but it’s too early to go into any specifics with more than eight months to the start in Mont Saint-Michel. We will have to study the parcours in detail and evaluate our strategy in due time”. Today, the route of the 103rd edition of the Tour de France was presented at the “Palais des Congrès” in Paris. Among big interest from among others André Greipel, Chris Froome and Mark Cavendish, the stages were discussed extensively. With a Grand Departure at the Mont-Saint-Michel, an almost forty kilometres long time trial and a stage finish on top of the Mont Ventoux, it promises to be a spectacle again. For the time trial specialists, the 2016 route is more favorable. After the 13.8 individual time trial kilometres of last year, they can show their skills on the 37 kilometres long time trial between Bourg-Saint-Andéol and Vallon Pont d’Arc. In the last week, the uphill time trial from Sallanches to Megève can be a turning point in the race. This year, the riders will ride counter clockwise through France, with first a passage through the Pyrenees before the peloton head to the Alps. On the 14th of July – Bastille Day –, the finish of the twelfth stage will be on the top of the legendary Mont Ventoux. With four mountain stages in a row, the peloton will have the hardest days in the Alps. With 232 kilometres, stage four is the longest of next year’s Tour. Also the sprinters get their chances to fight for glory with six or seven sprint stages neatly spread over the three weeks. André Greipel looks forward to the 2016 Tour and hopes to repeat his 2015 successes. “Last year it was an exceptionally good Tour for me. 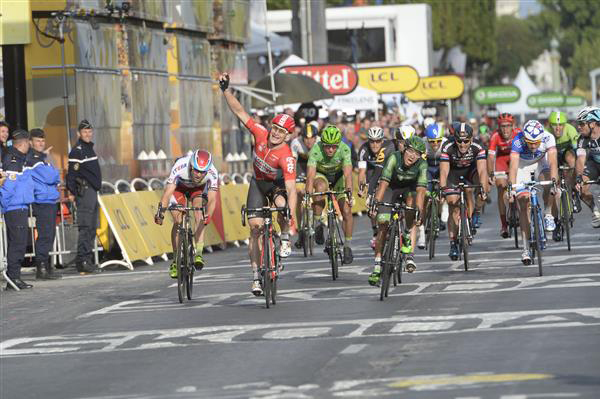 It will be difficult to match the four stage victories and the several days in the green jersey. The goal for next year is to win a stage again; the faster, the better. 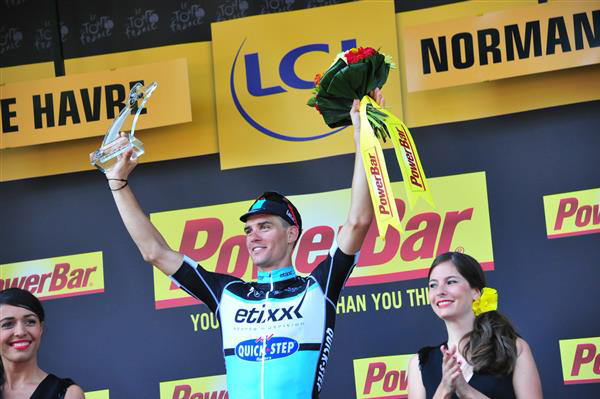 After the first win, the pressure is off and there will be new opportunities for a stage win. Also the chances to win the green jersey depend on this. But the yellow jersey on day one is an unique chance and a goal on its own." The official 2016 Le Tour de France presentation on Tuesday revealed a climber friendly, grueling 103rd edition. There will be no prologue or team time trial, though there will be an up-and-down 37km Stage 13 time trial, as well as a Stage 18 mountain time trial from Sallanches to Megève. There are also several stages for sprinters. The 2016 Le Tour de France passes through the legendary Pyrenees, and also includes a Mont Ventoux summit finale on Stage 12, beginning in Montpellier. The peloton will also race in the Alps, as well as Bern (Switzerland), in the third and final week of the race. The last few stages of the race will likely be decisive for the GC in the mountains, including the 17km time trial. 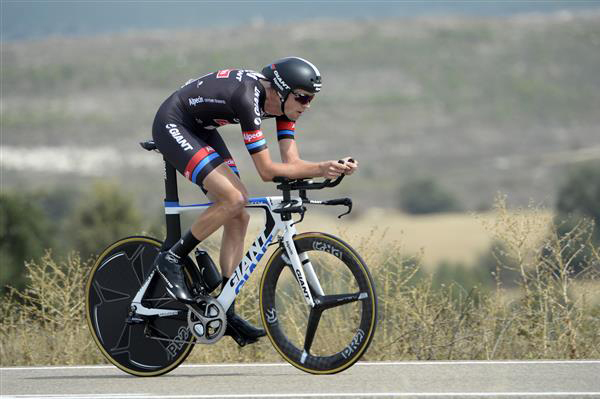 "There are two time trials, and five or six sprint stages," [Zdenek] Stybar said. "There is one stage that suits me perfectly, which is 2nd stage. There are a lot of mountains in this parcours. I have about 250 days to go and probably need to lose about 15 kilograms (laughs). But I think it will be really tough from day one. As for the presentation, it was a good experience and nice to be there. If I am to participate in the 2016 edition I will do my best to prepare for Le Tour and honor the race." "I was happy to be at this presentation, and was looking for stages that could be my chance," [Tony] Martin said. "I was looking for time trials or Classics style stages. There are two time trials, maybe one could be for me, even if it is difficult in profile and not a perfect fit. Another is a mountain time trial. The rest of Le Tour, there are chances for glory everywhere, even if there is a lot of climbing. The GC riders will be able to make a difference even in the first week. The first stage there may be a crosswind, but there are not really any Classics style stages in the 2016 Tour de France. The mountain stages look really hard, with climbs from the start for some of them. It maybe isn't the ideal Tour de France for a rider like me, but I am excited to see what my teammates and myself could do with this parcours next year." "I counted six stages for sprinters," [Mark] Cavendish said. "It's such a difficult parcours again, but there are more sprint opportunities than last year. Definitely, from a sprinter's perspective, it's super hard. We'll have to go full gas in the sprint days. You can't relax. So you look forward to the stages were it's flat, with a mountain at the end. But there's only one of them, and that one is Mont Ventoux. You can't go easy on Mont Ventoux anyway. So, the chance to relax is pretty limited. Even the time trials you have to push to make the time cut. There are a lot of stages with climbs from the beginning, so there will be a big gruppetto. In 2015 the gruppetto worked really well together. If that can carry on to 2016 then it should make it a little easier for us. I am sure, after 21 days, we'll all be really cooked again. But that's the beauty of Le Tour." Team Giant-Alpecin is pleased to announce that Johannes Fröhlinger (GER), Chad Haga (USA), Tobias Ludvigsson (SWE) and Tom Stamsnijder (NED) have renewed their contracts with the team. Fröhlinger and Ludvigsson have been with Team Giant-Alpecin since 2011, with the latter coming on board as a stagiaire that year. Stamsnijder joined the team in 2012 and Haga in 2014. Fröhlinger and Haga have extended their commitment to the team for another two years, while Ludvigsson and Stamsnijder have added one more year. “Johannes is a core member of the team,” said Team Giant-Alpecin coach Rudi Kemna (NED). “His knowledge and experience are valuable to us, and we are confident in his further development as a road captain. “Chad has shown progress during the two years he has been with the team, and we are happy to extend his contract. He will play an important support role while also having the chance to achieve some results of his own. Tobias has had a turbulent year, with some high highs and some lows. We are confident that we can work toward a stable level with him as a support rider in difficult races. With his strong time trialing skills we aim to develop his GC capacities as well. Erik Baška, the brand new European U23 Champion will join the ranks of Tinkoff Team next season. His strength and fast sprint abilities will be put to the service of his fellow countryman and World Champion, Peter Sagan. Tinkoff-Saxo is pleased to announce that another promising young rider will boost the squad in view of the 2016 season. Baška commented on joining Tinkoff Team in 2016: "This is, obviously, a unique chance for me and I couldn't be any happier. I am given the opportunity to join one of the strongest teams in the peloton and support the World Champion, Peter Sagan. This doesn't happen every day and I will do my best to demonstrate I'm worth the faith they showed in me." "I think that my fast sprint is one of my strengths and I would be delighted and honored to support Peter Sagan in his races. However, I will show the same determination and dedication wherever and whenever the team needs me", concluded Baška. Born on January 12th, 1994, Baška started out cycling at the age of 14 and quickly became a household name in his country's youth cycling competitions. In 2013 he joined the strongest Slovakian team, Dukla Trencin and in 2015 moved on to the Czech Continental team AWT Greenway. He is the Slovak U23 ITT champion since 2013 and won three UCI races in 2014. In 2015, Baška's wins include a stage at the Tour of Berlin and the Carpathian Couriers Race U-23. His latest and, by far, most important victory was at the European U23 Championships, where the race saw a very high pace and a fast bunch sprint finish. Baška proved to be the fastest and outsprinted his strong adversaries in the final 100m. World Champion, Peter Sagan, is pleased to have his fellow countryman join Tinkoff Team in 2016: "I'm doubly excited to see Erik join Tinkoff Team in 2016, not only because he's a fellow Slovak but, mainly, because he's a strong, promising and serious young rider. His recent victory at the U23 European championships speaks for itself and I look forward to welcoming him to the team. I think Erik is an example of the serious work at a grassroots level carried out in Slovakia and I am proud of him". Steven de Jongh, Head Sport Director of Tinkoff-Saxo, stated: "Baška has clearly demonstrated his talent and his recent victory at the European U23 Championships is a confirmation. He is a fast sprinter and I think he could be a good support for Peter Sagan. Similar to the other young riders that will join Tinkoff Team next year, he will have the best training and racing program to progress".